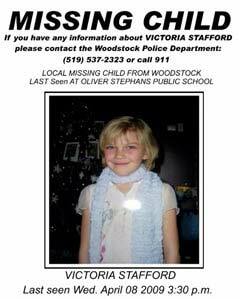 Victoria “Tori” Elizabeth Marie Stafford was an eight-year-old Canadian girl abducted from Woodstock, Ontario on April 8, 2009, sexually assaulted and murdered. She was last seen on security camera footage walking with Terri-Lynne McClintic. Her disappearance and the subsequent investigation and search were the subject of massive media coverage across Canada. The search for her body ended on July 19, 2009, when a child’s remains were found in a wooded area in rural Ontario and were immediately believed to be those of Tori Stafford. This was confirmed in a news conference held July 21, 2009. The police response to the situation as it developed and their failure to announce an Amber Alert has been criticized by the public, and has recently been the focus of a review of the Amber Alert system in Canada. The circumstances of her death were unknown to the public until a publication ban was lifted in December 2010. She was seen for the last time at about 3:32 pm Wednesday, April 8, 2009, on Fyfe Avenue, walking past a high school up the street from Oliver Stephens Public School. She was wearing a black Hannah Montana jacket with a white fur-lined hood, a green shirt, denim skirt, black and white shoes and carrying a purple and pink Bratz bag. A security video taken from the high school shows her walking with a person of interest. The person of interest is described as a white female aged between 19-25 – 5’1 to 5’2 tall and weighing approximately 120-125 lbs with straight long black hair worn in a pony tail. She was wearing tight black jeans and a white puffy jacket. The case was later featured on America’s Most Wanted. The initial investigation was led by Oxford Community Police Service, but then turned into a joint operation with the Ontario Provincial Police. On Tuesday, July 21, 2009, at 9:00 am police confirmed the remains found near Mount Forest, Ontario, approximately 500 meters from Concession Road 6, were that of Tori.Stafford was found naked from the waist down, wearing only a Hannah Montana T-shirt and a pair of butterfly earrings that she had borrowed from her mother. Her lower half was significantly decomposed. During an autopsy it was determined that Tori had suffered through a beating that caused lacerations to her liver and broken ribs. Her eventual death was the result of repeated blows to the head with a claw hammer. On May 20, 2009, police charged Michael Thomas Rafferty, 28, with first degree murder and Terri-Lynne McClintic, 18, with being an accessory to murder (in addition to lesser charges) in the abduction and suspected murder of Tori. Ontario Provincial Police indicated that Tori’s mother, Tara McDonald, was familiar with McClintic. McClintic assisted the police search for the remains of Tori Stafford after her arrest and her lawyer stated that her client “wants Tori’s family to know she is trying hard to find her body”. On May 28, 2009, McClintic’s charges were altered to a first degree murder charge and an unlawful confinement charge, and it was announced that the accused would be tried separately. McClintic was scheduled to make an appearance in court on April 30, 2010, but a publication ban was imposed by the judge on the events of the day. The publication ban was lifted on December 9, 2010, revealing that Terri-Lynne McClintic pleaded guilty to first degree murder. She was sentenced to life in prison. On March 5, 2012, the trial of Michael Rafferty for the kidnapping, sexual assault, and first-degree murder of Tori Stafford commenced. On May 11, 2012, at 9:18 pm ET, the jury found Rafferty guilty on all charges. Four days later he was sentenced to life in prison with no chance of parole for 25 years. Claiming that the “judge’s instructions to the jury were flawed,” Rafferty appealed his conviction to the Court of Appeal for Ontario on July 26, 2012. The 30-day deadline to appeal had passed by the time the papers were received, but this was attributed to his “inability to use the telephone to contact legal counsel,”  and an extension has been requested. Rafferty’s appeal papers appear to have been filed from Kingston Penitentiary. They all should get the death sentence… It is not fare the poor girl lost her life and was killed in such bad why and they get only life sentence….